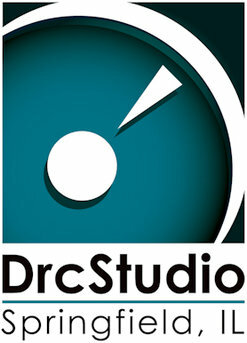 DrcStudio is central Illinois' longest running recording company providing creative and technical services for the production of music albums, custom music, audio for radio and television programs and commercials; and sound design for film, video and multimedia. Our cutting edge technology (starting with Avid Pro Tools HD) and decades of professional experience will help make your project the best it can be. DrcStudio also offers: Professional Music Mastering | Media Transfer | Sync-to-Picture | Midi and Drum Programming | Tape Baking and Restoration | Vinyl Restoration | CD, DVD and Blu-ray One-Offs with Printing On-Disc | CD, DVD, Blu-ray and Vinyl Disc Replication. In addition, we offer: HD Video Production | Multimedia Production and Exhibition | AV Software and Equipment Installation and Maintenance. Genres of music we specialize in: Rock, Country, Folk, Jazz, Contemporary Christian, Classical, and Singer/Songwriter. Conveniently located... DrcStudio offers a relaxed, comfortable and creative atmosphere. And we're just minutes away from great eateries, shops, entertainment, lodging and the historic Abraham Lincoln sites! For more information, or to schedule a session, please visit our Contact page today! Or click here now to request a custom quote!